There is a scene toward the end of the movie Swingers where Trent (Vince Vaughn) jumps up in the middle of a diner to pronounce that his boy Mikey is all growns up. I had these same sentiments this past Saturday at the Maryland Craft Beer Festival. I felt really proud of Maryland Beer. For the longest time Maryland Craft Beer has been a tentative sort. There were a few larger staple brewers, namely Flying Dog and Heavy Seas. But all the rest had a transient feel to them. Brewer’s Art and Oliver’s Ales were some that were around consistently, and that was nice, but the rest you just weren’t so sure of. Remember Oxford? One of the first Maryland craft beers. Began producing Oxford Class. A wonderful Amber Ale that then had issues with consistency then eventually disappeared. Then there was Claypipe. They never produced the greatest beers, but they had potential. But then they apparently lost interest and sold their facilities to Pub Dog. These are just a couple of examples that has been common place in Maryland beer for a while. But once we all felt comfortable, that Flying Dog was a not only producing beer in Frederick, but becoming a great supporter of Maryland and Maryland beer. Not saying that it’s because of Flying Dog presence, but I don’t think it hurt either. Things just started falling into place. Evolution moved their operations to Maryland, Union Craft Brewing was established, and Burley Oak opened their doors. Things were really changing. Fast forward to last weekend’s Maryland Craft Beer Festival and you see a group of breweries that are established, and making good product alongside up and coming brewers that are already producing equally impressive beer. So while saying they were all grown-up may not have applied to the individual brewers, but the brewing industry in Maryland as a whole. Flying Dog has certainly taken the lead in mentoring the other brewers in the state, and taking a leading position in the Brewer’s Association of Maryland (BAM). Seeing Flying Dog in this role is really pleasing. Flying Dog, as many of you know was located in Colorado for their first 16 years. Then they started transitioning their brewing operations to Maryland in 2006. When this began, Marylanders were excited to see Wild Goose’s facility being filled with a well-known brewer, but we didn’t really know what to expect. By 2008 Flying Dog had transitioned all of their brewing to Maryland, and had left Colorado behind. Flying Dog has truly made Maryland their home. From their merchandise, to their most recent homage to Maryland with their most recent summer beer, Dead Rise. Dead Rise is made in conjunction with McCormick Spice to create a custom version of Old Bay to brew with. What they came up with was basically a version of Old Bay that is low sodium. So when you are drinking you don’t feel like you are drinking sea water. Just a touch of salt on the finish. And of course a portion of the proceeds go to the benefit True Blue, a program that advocates on behalf of the Chesapeake Bay’s 5,500 watermen. But this is just the most recent of Flying Dog’s celebration of Maryland. Their yearly Secret Stash beer is made from all local ingredients. Pearl Necklace is made from local Rappahannock River Oysters and a portion of its proceeds benefit the Oyster Recovery Partnership, which coordinates and conducts oyster restoration in the Chesapeake Bay. And of course, my favorite part of Flying Dog’s good citizenship is the huge amount of work they have done in Annapolis to improve the laws surrounding how we get to enjoy beer. This benefits the consumer, Flying Dog, and every other brewery in Maryland. The sign of Maryland beer is growing up isn’t just because of the recent mentorship of Flying Dog. Heavy Seas has always been a pioneer in getting legislation to make sense. Or at least a little more sense than it made before. Some of the other reasons are the little guys, the young guys. Like Backshore Brewing Co, Jailbreak Brewing Co, Milkhouse Brewery, and Push American Brewing Co. Out of that group none is older than a few years old. Some of them still have that new brewery smell if you know what I mean. And the great thing is that they are making solid beers. Jailbreak Brewing got to show off its first barrel aged beer at the festival. Barrel aging is where I really think Jailbreak is going to make a mark. Right out of the gate they have a Bourbon Barrel Aged version of their Imperial Coffee Stout Dusk til Dawn that is gorgeous. So here is the reason that I think Jailbreak may really hit its stride with barrel aging. There are a few components that go into making a great barrel aged beer. Making a really great beer to go into the barrel is pretty obvious. Having access to world class barrels to age the beer in is another important component. And finally having a palate that can both judge when the beer has aged enough in the barrel and can pair perspective beers with the right type of barrel. I think between Ryan Harvey and Justin Bonner they have all of these bases covered. Another standout from a youngster at the festival was Push American Brewing. Push is the brewing arm of Frisco Taphouse in Columbia, MD. I am really only going to mention one of their beers, since they only had one that was brewed by their new brewmaster, Ben Little. But that beer is fabulous. Reckless Ascension is one of the best IPAs made in Maryland today. I was very impressed. Keep an eye on their upcoming releases, I have a feeling this isn’t the last great beer brewed there. Dan Baumiller (Full Tilt) and I enjoying a Diet Coke? I was also lucky enough to get a sneak peak at Full Tilt’s new Fully Tilted line. Their first offering is basically an amped up version of Baltimore Pale Ale that is then aged on oak chips. What I had was about the freshest beer you can get. Completely unfiltered albeit a little under carbonated, but that is to be expected. I expected the finished version to be even more hop forward with the correct carbonation. So you might ask, is there anything that could have been better with the Maryland Craft Beer Festival? And of course would be my answer. There was some confusion about when VIP beers would stop serving. Whether it was right at 1pm or when the VIP beer ran out. I was a little disappointed with the brewers that chose 1pm as the cut off. There were some issues with the water stations running out of water. And by the end of the festival I was much more interested in the water than the beer. The layout could use a little improvement as well. Although it was significantly better than last year, there is still plenty of room for improvement. 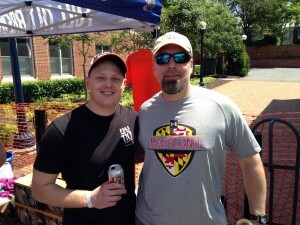 Overall the Maryland Craft Beer Festival has really become a showcase for a now mature brewing community. I really did feel so proud to look around at the multitude of attendees and brewers and think that this is a huge step from where Maryland Beer was just a few short years ago. While congratulations are in order this is just the first step of many. While writing this, I enjoyed a…..
Wow! Oliver’s has been brewed at Pratt St for 20 years and we’re considered one of “the rest you just weren’t so sure of”! You made a boo boo in my feelings. You know that was truly an oversight. My apologies Steve. Because I have been drinking Oliver’s for about 19 years now. Used to spend many a happy hour at the Wharf Rat in Fells with an Oliver’s in my hand. By the way… I fixed that oversight.